BHIMDUTTANAGAR :Two female swamp deer have been translocated to Chitwan National Park from Shuklaphanta National Park in Kanchanpur district on Wednesday. Chief conservation officer at the Shuklaphanta National Park Ved Kumar Dhakal said the two swamp deer have been transferred in the first phase. The Ministry of Forests and Soil Conservation had decided three years ago to translocate the swamp deer from Shuklaphanta to Chitwan National Park and Bardiya National Park. As per the government decision, 10 swamp deer are to be translocated to Bardiya National Park and 25 to the Chitwan National Park. 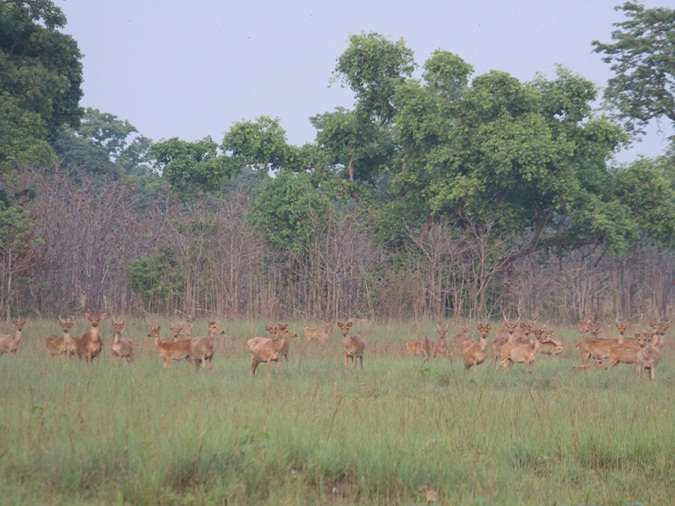 Pursuant to the government decision, three female and two male swamp deer were translocated to Bardiya National Park in the first phase last year. Dhakal said altogether 10 swamp deer including five females and five males would be translocated to Bardiya and 20 females and five males to Chitwan, gradually. He said a team comprising 50 technical staff and assistants from the Shuklaphanta National Park, National Trust for Nature Conservation and the Bhawani Baks battalion of the Nepalese Army responsible for protecting the national park has been mobilized together with five elephants for the swamp deer translocation.